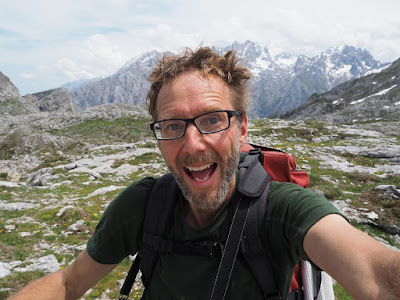 I've long wanted to go hiking in Los Picos de Europa ('The Peaks of Europe') in northern Spain - so long, in fact, that I can't even remember how this small but perfectly formed mountain range got on my bucket list in the first place. Last week I finally got there. I didn't manage to visit every spot I wanted to - I wildly under-estimated how long it would take to get around the mountains by public transport (i.e., buses and hitch-hiking) and how tough some of the trails are - but that just means I'll have to go back some day. 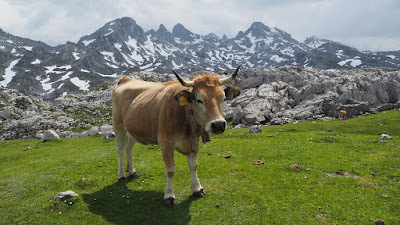 This is one of the residents of the Picos. 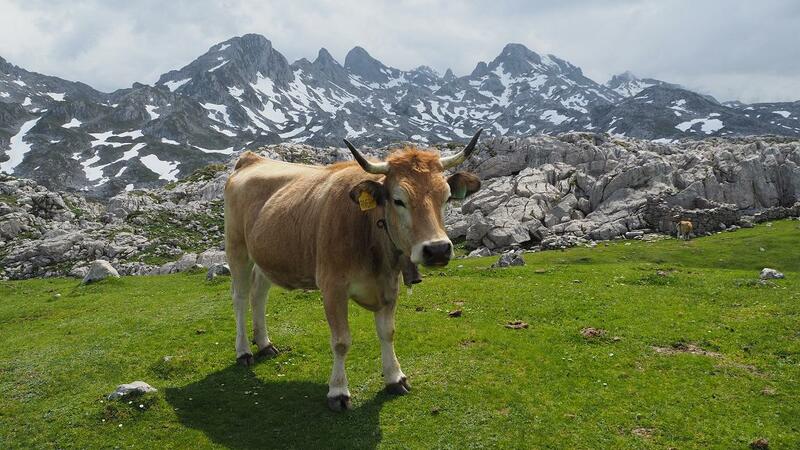 The higher slopes are home to thousands of cows, kept for their milk and some particularly potent, smelly cheeses. Every cow wears a bell of a different note, with the result that the mountains echo to a never-ending clanging and tinkling like some kind of wildly out-of-tune, drunk, demented orchestra. * The Peaks of Europe got their name during Spain's age of exploration. Because the mountains are near the coast and more than 2600m high, they were often the first sight of Europe for Spanish sailors returning home from discovery or conquest.